"Legalized bribery," that's how Sen. John McCain describes the rat's nest of politicians, lobbyists and special interests in Washington profiting from a broken system of pay-to-play politics. This is a bipartisan problem -- meaning that both Democrats and Republicans are playing the game. For example, take a look at the alleged abuse of power by Senator Robert Menendez (D-NJ) concerning his shady dealings with the eye doctor, Salomon Melgen. Over the years, Melgen has given the senator nearly $1 million in gifts and campaign contributions. In return, Menendez allegedly greased the wheels on visa applications for Melgen's foreign girlfriends and pushed for a Medicare policy change that would eventually save the doctor millions of dollars. While the senator saw this as two bosom buddies helping each other out (neglecting the strict bans placed on Congressional members for accepting gifts), a federal grand jury indicted the two friends on corruption charges earlier this month. As we collectively scorn Menendez for using his political power as a bargaining chip for beachside getaways, we should note how Menendez now joins a long list of politicians in denial about their corrupt deeds. In 2013, Governor Bob McDonnell (R-VA) also claimed he broke no laws when he promoted to state health officials a new dietary supplement from the company, Star Scientific, while receiving more than $177,000 in gifts and loans from its former CEO. And at the start of this year, news came of Sheldon Silver's arrest for receiving millions of dollars in bribes and kickbacks while Speaker of the New York Assembly. Silver also proclaimed that he was innocent. These criminals might have been caught red-handed, but it's clear that the majority of politicians are being paid by corporations and the wealthiest to pass laws which benefit them at the expense of the rest of us. There is massive outrage bubbling up in every corner of this country from both conservatives and liberals about how politicians serve big money over We the People. Many like Menendez seem incapable of seeing a political bribe for what it is, much less fend off one, because our pay-to-play political system makes special interest money inseparable from the electoral process. This is a bipartisan concern. As the cost of elections exponentially increase so does Washington's tropism towards their biggest donors. With the new fundraising demands, presidential hopefuls like Hillary Clinton, who has vocalized her support for electoral reform, will still be accepting campaign contributions from lobbyists this coming election cycle. And Marco Rubio, following his announcement to run on Monday, has been chasing down donors all week. 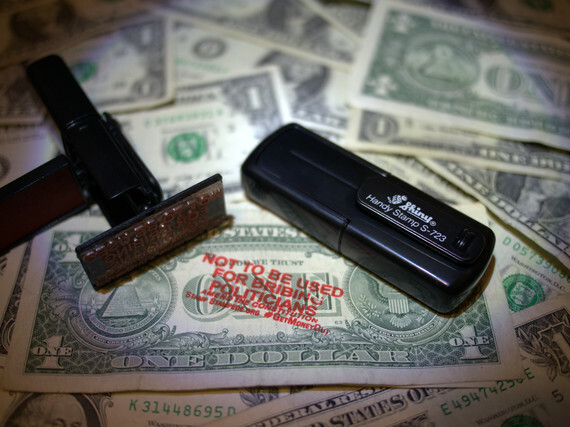 Over 30,000 citizens and growing have joined the guerilla campaign, StampStampede.org and they're rubber stamping their dollar bills in red ink with "Not to Be Used for Bribing Politicians" or "Stamp Money Out of Politics." This visual protest (it's legal!) is unleashing millions of miniature billboards with anti-corruption messages. They are starting conversations about campaign finance reform and even showing up in the hands of politicians. Voters want candidates who are beholden to them, not big money. We're sick of hearing about millionaires cutting deals with feckless politicians. Americans (Republicans, Democrats, and Independents) nationwide think there is too much money in our elections -- 73 percent want a constitutional amendment to overturn the Supreme Court's Citizens United ruling in 2010, which led to unrestricted campaign spending. This movement has legs -- it may even be springing wings! -- as one fed-up man landed his gyrocopter by the U.S. Capitol to demand a more honest government and campaign finance reform. There are millions of individuals and hundreds of national organizations that have demanded that we get big money out of politics. This grassroots-powered movement won't stop agitating the wheels of government until we fully restore a government of, for, and by the people.